The last time you went grocery shopping, you may have picked up a bag of apples or a pint of strawberries, some leafy greens for a salad, or some carrots to munch on. Good, healthy choices. But did you wonder where the products were grown, how the workers were treated, or the impact that shipping may have had on the environment? Most of us don't often give much thought to such issues. But Emory junior Hannah Jill Dugoni wants us to – which is one reason why she launched Emory Local Roots in 2014. The goals of the student-run initiative include elevating the university community's awareness of the benefits of consuming locally produced foods and making such products easily available to students. "When I came to Emory, I didn't feel I had many options for buying locally grown foods," says Dugoni, who is being recognized this month by Campus Life for her sustainability work. "Back home, we knew where our food came from and who raised it," says Dugoni, who grew up in Portland, Oregon, where her family maintained a vegetable garden and raised chickens, like many families in their community. "In addition to what we produced for ourselves, there was a big market for locally grown foods." Local foods offer many important benefits, according to Dugoni. For example, fruits and vegetables may be fresher, taste better and retain more nutritional value because they are harvested when ripe rather than picked early and shipped long distances, which impacts the natural environment. Buying local produce also supports local farmers and the local economy. Beginning fall semester, thanks to Local Roots, Emory students will be able to purchase a range of local produce on campus. With a month-to-month online subscription, students can drop by the Emory Farmer's Market outside Cox Hall on Tuesday of each week to pick up a tote bag packed with sustainable and fresh seasonal fruits, vegetables, jams and other local products, as well as recipe cards and educational information. "We will be able to accommodate 40-50 subscribers this fall on a first-come-first-serve basis," says Dugoni, who expects the program to expand with spring semester 2016. "Unfortunately, we cannot serve as many students as we would like right away because we are a startup with limited capacity." A $1,500 grant from the Office of Sustainability Initiatives (OSI) and additional support from Emory Dining paid for the tent, table, tote bags and promotional materials. The $40 monthly subscription covers the cost of foods, which include healthy snacks as well as fresh fruits and vegetables. The program purchases directly from Farmer's Market vendors like Sunshine Farms, Pure Bliss and others, eliminating the expense of transporting foods from farm to campus. Local Roots is managed by a volunteer executive board of seven students, including Dugoni, and will recruit additional student volunteers in the fall from the Center for Human Health, which partners with Local Roots, along with Emory Dining and OSI. According to Campus Life, students who embrace the concept of a "healthy and sustainable environment" demonstrate a "commitment across the university to developing wellness and useful personal and life skills – and an engagement in practices that consider the needs of the present generation without compromising the needs of future generations." As Campus Life's recipient of the Dean's Definer of the Month award for April, Dugoni embodies that commitment. The Dean's Definer of the Month award highlights important key concepts from Campus Life's vision and mission statements. "Hannah's Local Roots program and her other contributions to creating a healthy and sustainable environment reflect a commitment that she shares with thousands of other Emory students," says Chad Sunstein, manager of operations and sustainability for Emory Dining, the Campus Life department that worked closely with Dugoni to launch Local Roots and continues to collaborate with the initiative. Sunstein also works with Dugoni on the Food Advisory Committee Emory. FACE is a student-run group that convenes Emory students and dining staff at monthly public meetings to keep the student body informed of new developments and to invite input on food services issues. 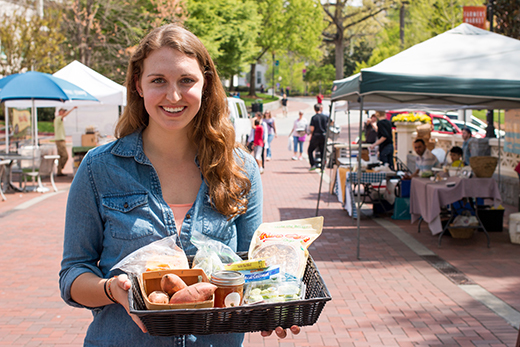 As FACE's vice president for sustainability since her sophomore year, Dugoni works with Emory Dining to bring more local food vendors to the Farmer's Market and increase student awareness of sustainability issues. With a psychology major and predictive health minor, Dugoni is not yet sure what her long-term career field will be. However, she is confident that she will serve others by combining exercise, diet and lifestyle as preventive medicine, a topic she studied in India last summer. "Many of us are so busy that we don't think much about eating healthy, maintaining healthy lifestyles, or where our food comes from," says Dugoni, who was a member of the varsity soccer team her freshman year. "Local Roots wants to make it easier for students and all members of the Emory community to practice sustainability for a lifetime." But Dugoni is not limiting that goal to the Emory community. While launching Emory Local Roots this fall is her present focus, she envisions the initiative eventually as a nonprofit organization with affiliates on campuses throughout the country – providing healthy food and nurturing healthy lifestyles for an entire generation of students.